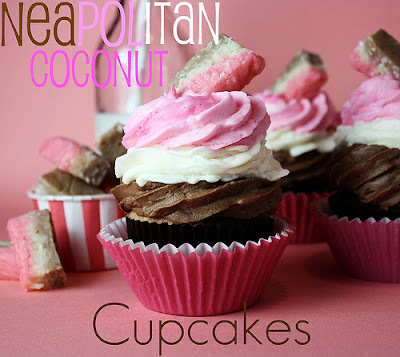 I typically only post about recipes that I have tried or plan to try, but I have no intention of making these gorgeous little cupcakes from Confessions of a Cookbook Queen because they are a mound of coconutty goodness and I am not a fan of coconutty anything. 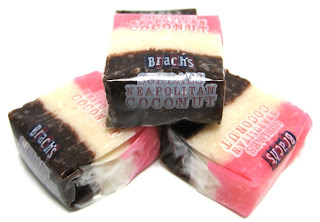 But the triple layer of frosting was too cute to pass up and athe Neopolitan candies that you can buy by the pound in the Brachs candy section were my Grandpa's favorites. So even though I have no intention of ever putting one in my mouth, I know how passionate someone can be over these pretty coconut candies. 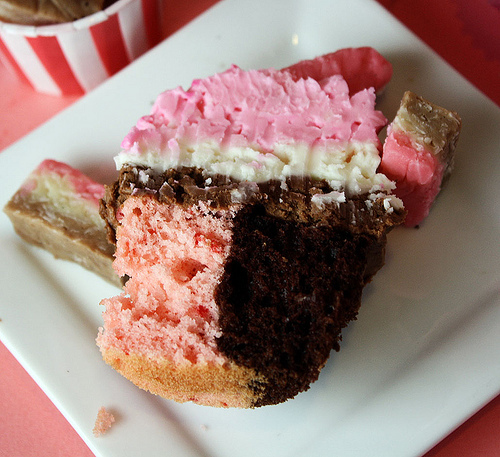 If you are one of them, you will want to head over and get the recipe for the cupcake AND the homemade candy HERE. And even if you aren't, Kristan's post is too funny not to read, so check it out anyway! thank you for sharing where to find these! You know how I feel about frosting, right? Seriously????? I have no choice but to make these scrumptious looking creations. When you see me in Kentucky just know that I was 10 pounds thinner before I tried all of the yummy recipes you post.